“When it comes to planning a wedding reception, the role of an MC is often underestimated. However the MC should be seen as a vital part of this very important occasion. In view of that, it makes very good sense to hire a professional wedding MC for the following reasons…. (1 They have the experience to take on this most important role. (2 They can focus totally on the job whereas a wedding guest acting as the MC has divided attention. (3 They have a reputation to protect so will make sure that they deliver every time. (4 They will competently liaise with everyone at the Reception including the Bridal Party, Venue Function Co-ordinator, Wedding Planner and DJ/ Band. (5 They will have a strong and commanding voice which is necessary to get the attention & respect of the guests especially later in the reception when things can get a bit rowdy. (6 They will expertly control the flow of events to ensure the reception goes to plan. (7 They will effectively and seamlessly handle any awkward situations if they do arise. (8 They understand the important balance between performing the formal duties and adding humour. (9 They will ensure that your guests have lots of laughs and this will include spontaneous humour plus tasteful funny material about the bride and groom. (10 They will be sensitive to your guests’ varying ages and cultures. (11 They will make your special day even more special. 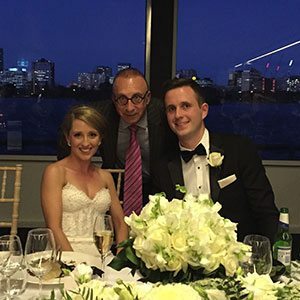 And the good news is that a professional wedding MC can easily be found by using specific Search Engine keyword phrases like wedding mc sydney, wedding mc melbourne, wedding mc brisbane or wedding mc anywhere else.